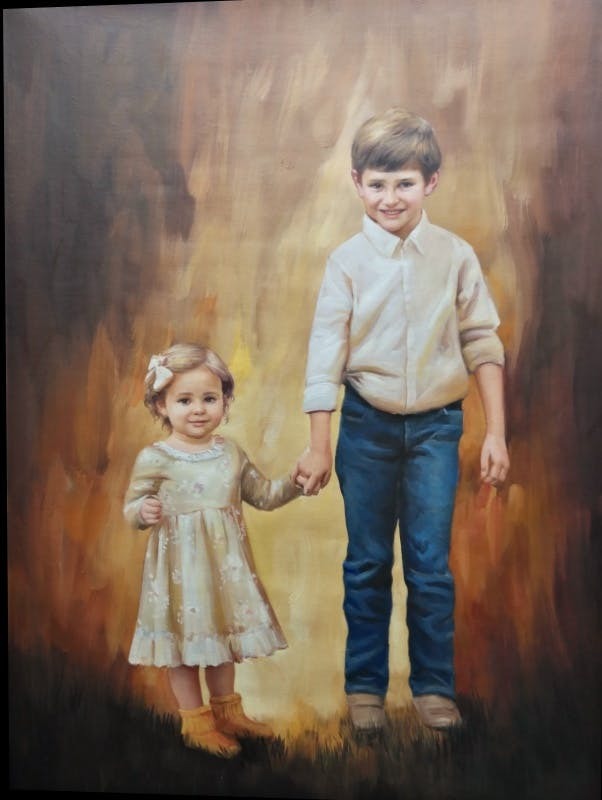 I would like to use the background and color scheme of the brown and cream photo of the little girl looking down. I would like the image to be of brother and sister in the other two photographs. The Brother in the photo where he is looking at the camera and with a cream colored shirt as depicted in the photo with the background. The Sister in the photo where she is looking at the camera, the same dress she has on but in cream color scheme as the background photo depicts. I would still like them to be holding hands, standing together with their bodies slightly turned toward each other (like sister in the photo of her looking at the camera) I would prefer the portrait orientation rather than landscape and a set of angel wings VERY subtley painted into the background above them to the left. The angel wings aren't truly meant to be seen unless you know they are there.